Valerie Perri as the faded Hollywood silent film star in “Sunset Boulevard” by Moonlight State Productions. Sadly, the musical version of the bleak Hollywood exposé is also kind of small, a pale shadow of its superb and unforgettable forbear. It’s also long, surprisingly static, and the score, except for two excellent songs, is lifeless and unremarkable, often more recitative than melody. No wonder it’s so rarely produced. The show’s recent return to Broadway, as with any production of the 1993 Andrew Lloyd Webber/ Don Black and Christopher Hampton musical, is all about star power. In New York, it was all about Glenn Close reprising the role she first assayed in 1993. Now, Moonlight Stage Productions steps into the ring. Impressively, the company is using the full Broadway orchestrations, with a 23 skillful musicians in the pit (JD Dumas, musical director; Kenneth Gammie, conductor). The sound is sumptuous, as are the towering sets (rented from Music Theatre of Wichita). 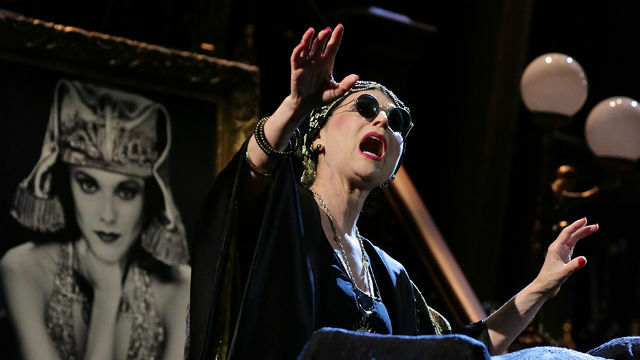 Though most of the costumes are also rented (from The Theatre Company in Upland, CA), the splendid, extravagant outfits worn by this Norma Desmond (Valerie Perri), the faded, fantastist Hollywood silent film star, the one who thinks she’s “still big,” were created right here, by the ingenious maker of “magic in the moonlight, Renetta Lloyd. Every time Perri enters, and swooshes down that signature staircase in her crumbling mansion, she sports a new getup, each more ornate and outrageous, turbaned and bespangled than the last. Stunning work. The rest of the versatile cast — portraying onscreen and behind-the-scenes Hollywood denizens — wear period outfits that help define the era. The singing is marvelous; the staging and choreography, by Larry Raben, are lively enough. But there’s little sense of noir here. This is pretty straight storytelling, without the edge. Robert J. Townsend plays Joe Gillis, who’s face-down in the pool when we first encounter him (outstanding projections by David Engel). He’s narrating his bizarre story, after death. For a disheveled, down-on-his-luck screenwriter, about to have his car repossessed by two insistent thugs, Townsend’s Joe looks remarkably clean-cut, well-groomed, even Hollywood plastic. He lacks the sly noir sensibility, which makes many of his fast-paced, sarcastic comebacks fall flat. Townsend sings beautifully, especially nailing the title tune at the top of the second act. Joe’s life takes a sharp turn when he accidentally winds up in the driveway of the once-great Desmond, who lives in a dreamworld of her former glory. Norma “hires” him to help her with the gargantuan (disastrous) “comeback” screenplay she’s writing. The job requires full-time residence, subservience to Norma’s every whim and her fragile mental state, and ultimately, sharing her bed. When Joe finally realizes he’s in love with a young, wide-eyed, Paramount employee, Betty Schaefer (perky, adorable Katie Sapper), and tries to regain some sense of self-respect, it’s far too late. The wild-eyed, demented, garishly made-up appearance of the movie’s Gloria Swanson made her ghoulish and unforgettable. This Norma seems more desperate for love than deeply disturbed and totally lost in her lack of reality. One other aspect of the production that doesn’t quite work: the age discrepancies. Perri doesn’t seem that much older than Townsend, and Sapper doesn’t feel decades younger than he. This perception skews the relationships as written. Still, the performances are the highlight of the evening. It’s an underwhelming musicalization of a brilliant screenplay. Even so, it should paint a darker, edgier, more revealing portrait of the unpleasant, un-glamorous underbelly of Hollywood and the studio system. Running time: 2 hrs. 20 min.